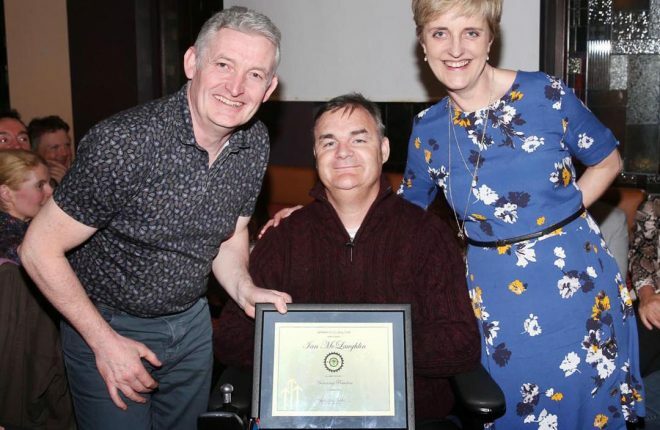 Pajo Rafferty, Brian McCormick Sports, Letterkenny, and Ryan Ferry, Donegal News presents the Donegal News Sports Personality of the Month award for July to Ciaran Gallagher. CIARAN Gallagher’s clean sheets were vital to Finn Harps as they claimed promotion three years ago, and the goalkeeper is again in top form as the Ballybofey men target a return to the top flight. 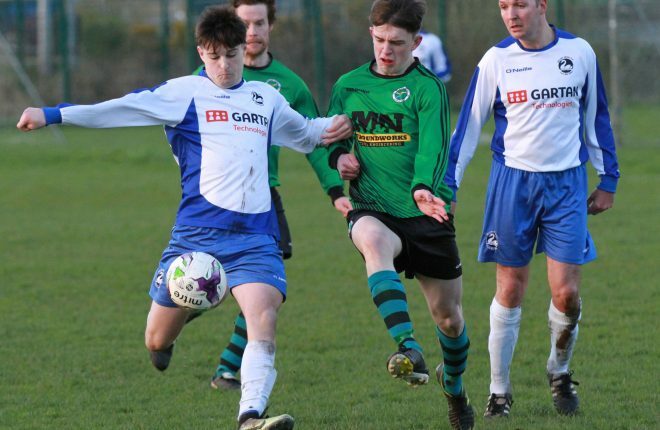 The season didn’t get off to a great start for Gallagher and his teammates, and as they headed off on their mid-season break, Harps were loitering in and around the play-off spots, but their inconsistent form suggested that things weren’t exactly going to plan. However, with a few tweaks during the break, Harps were much improved in the month of July and haven’t looked back since. Gallagher claimed four clean sheets in four games, as Harps put an impressive unbeaten run together and powered up the table. They have gone from strength-to-strength, and look set for a big end to the season with a play-off spot already secured. 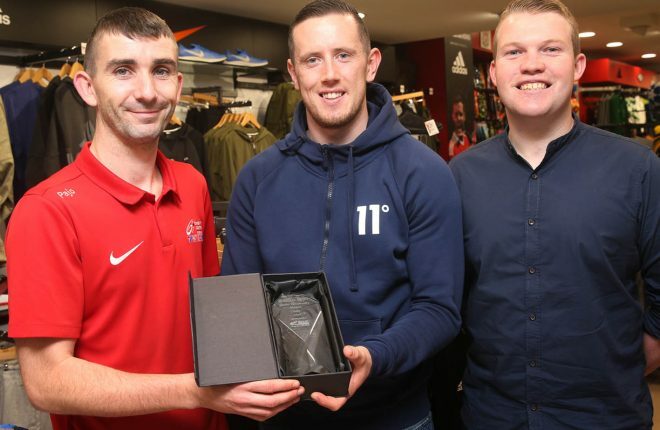 “Things really started to pick up for us after the break,” said Gallagher, who was this week presented with the Donegal News Sports Personality of the Month award for July, in conjunction with Brian McCormick Sports & Leisure. 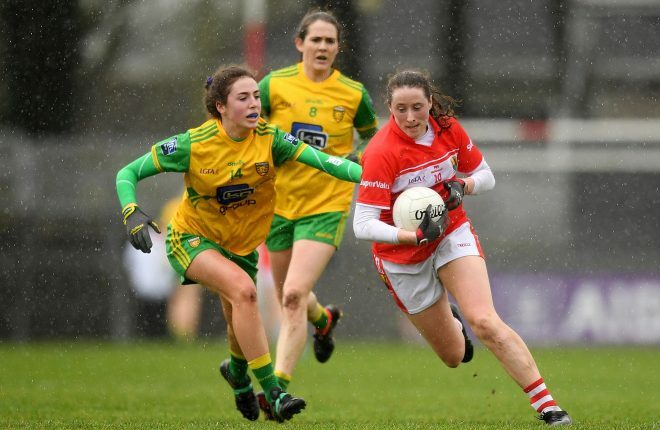 “We were a bit downbeat before that after we lost to Longford and UCD, and you always want to go into the summer break on the back of a positive win, both from the team’s perspective and yourself as well, so you can enjoy the time off. “We beat Cabinteely, and then we had a great run of form in July as well, and that built up a lot of momentum. Harps recorded excellent 1-0 wins away to Drogheda and UCD in July, and they also defeated Longford comfortably in Ballybofey. There was a bit of disappointment when they only claimed a draw against Shelbourne, but as he reflected back, Gallagher said that was a crucial point too. “We had three tough games with Shels, and they have a really strong defensive record. “We drew with them, and while we wanted to win, it still kept our unbeaten run going. “The win in Cobh was great because that is one of the toughest grounds to go in both divisions. “It’s a long journey, and they are a tough team to play against with the way they set up. Gallagher prides himself on his ability to keep clean sheets, and he has had 13 shut-outs this term. However, he is quick to point out that it takes more than just him to keep the opposition at bay. “Any team that is successful, needs to build solid foundations at the back. “Our form was a bit stop-start at the beginning of the season but we have all improved. “We have built up good momentum now, but it’s not just up to me or the back four. Everyone is working really hard, including the management. Harps and Shelbourne have conceded the least amount of goals in the league (20 each) and it’s no surprise that they have both done well this year. 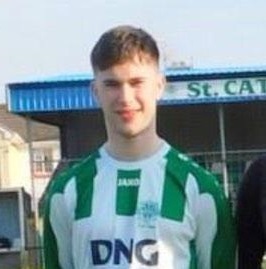 Ollie Horgan’s team had defensive issues last season in the Premier Division, and while there is an obvious drop in standard in the First Division, the form of Keith Cowan and Sam Todd has been key to their meanness and they are two of the best defenders in the league. Gallagher said: “Keith missed all of last season, so it’s like have a new signing for us. He has the experience and he has been excellent. “Sam is young and he has a bright future ahead of him. He has a great attitude and is very keen to learn. “It’s not just those two either, you have a good core there that have played a lot of football. There is a significant amount of positivity surrounding the club at the moment, and that was added to last Saturday when the Under 17 team landed the Mark Farren Cup. Gallagher said: “Before the summer break, there wasn’t much of a feel-good factor but it’s there now. 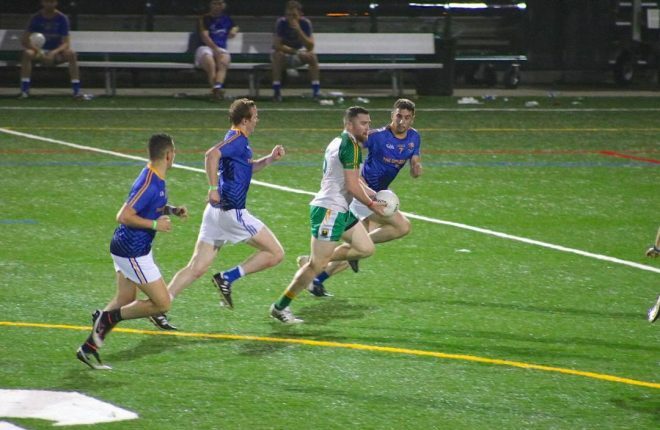 “Things are going well and we have a great underage structure now as well. It was great to see the lads win last week, and that filters right up through the club. “I love the big games and playing in a packed-out Finn Park, but at the same time, we’re under no illusions about how difficult it will be to win promotion.